Cereal At Midnight: Pop Culture in Analog: Coming Soon: Colossus of Rhodes and "The Sartana Collection"
At Wondercon 2018, Warner Archive had a panel in which they revealed that they'll be releasing two films on Blu-ray soon. First is Dark of the Sun, which is a 1968 war film that co-stars Big Jim Brown and has a cool poster of a guy wielding a chainsaw. I've never seen the movie, but I can't wait to check it out. However, it's the other film they announced that has me more excited: Spaghetti Western legend Sergio Leone's directorial debut, The Colossus of Rhodes! The Italian film is one of the better entries in the sword and sandal sub-genre (aka peplum) and I'm very anxious to add it to my shelf next to the director's other films like The Good, The Bad, and the Ugly and Once Upon a Time in the West. I saw Colossus of Rhodes years ago and enjoyed it for what it was given the budget limitations, and I'm eager to revisit it in HD. The actual Colossus of Rhodes is my favorite of the Seven Wonders of the World, and this is one of few movies I can think of that features the iconic statue.No specific date has been given, but both films are due in late spring or early summer. Each film has been given a brand new 2K restoration from the original camera negatives and will feature a bevy of special features like interviews, commentaries, photo galleries, reversible artwork on the Blu-ray sleeves, and the box set will include a book of essays by Roberto Curti and a Spaghetti Western timeline by Howard Hughes. The set is limited to 2500 copies. I'm so excited about these movies that I can hardly wait. 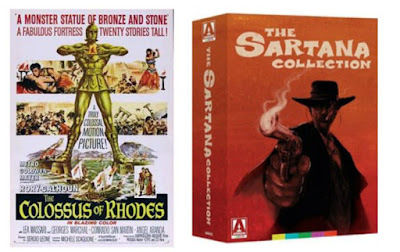 I've only seen the Sartana films in edited, cropped versions that pop up in those big multi-movie packs from public domain companies. This summer is going to be a great time to be a genre fan.